This post was in our drafts for a while now. 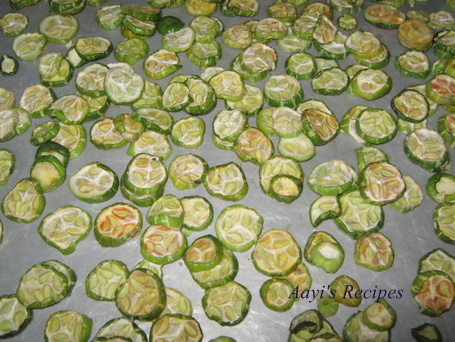 We sun dry many vegetables, which make nice crispy accompaniments with meals. One such vegetable is tindora or tendli. Once dried, these are stored in air tight containers. While serving, these are deep fried. For health reasons, I fry them in a tea spoon of oil, a handful at a time on a very low heat. They go very well with curd and rice. Apply salt to tendli pieces and keep it aside overnight. The pieces leave a little water. Discard the water. Spread the pieces on a clean cloth or a thick plastic paper and sundry them. 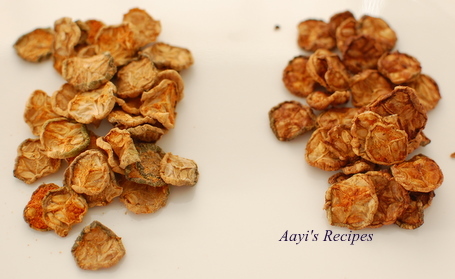 After 2-3 days when they look slightly dried, make a paste of red chili powder and asafoetida with a tea spn water, and apply this paste to the pieces. 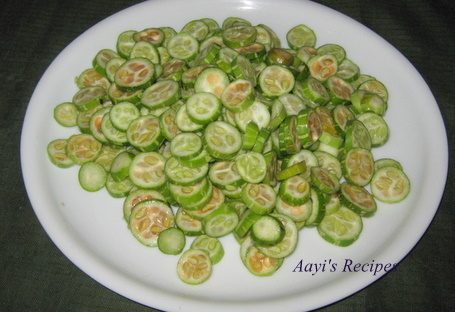 Spread this on the paper again and sun dry them till they become very crispy. When they are cooled to room temperature, store in air tight container. While serving, fry them in oil. Mouthwatering!!! Though it takes little longer the wait time pays off at the end. Love these sundried tindora.We call the sun dried veggies as orugulu. Delicious..I love them too..reminds me of my school days! thanks. Wow! I do the same for Bitter gourd and other such veggies. But never though of drying Tinda like this. Thanks for sharing. Love to drop here often for such helpful tips. Best wishes. Take a tea spn of oil in a thick bottomed pan. Heat the pan. Reduce the heat to medium low. Add the sundried item. Keep stirring it. It takes a while to get fried, but tastes the same like deep fried. Do not put too much at a time. Sounds great! Should be nice. I like this vegetable very much, butnever heard of drying them so. I never knew tendlis could be sundried but sometimes found them in pickles along with other crunchy veggies like carrots, cauliflowers etc. 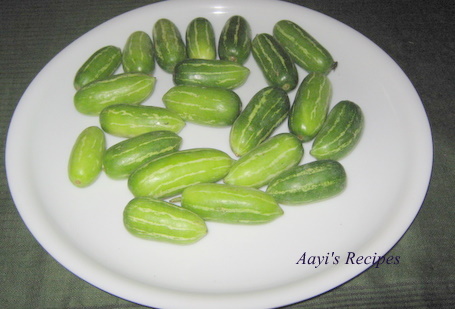 If u have a recipe for such pickle please post. I am planning to give this recipe a try very soon. This is a good accompaniment with Curd-rice or Dal-rice. 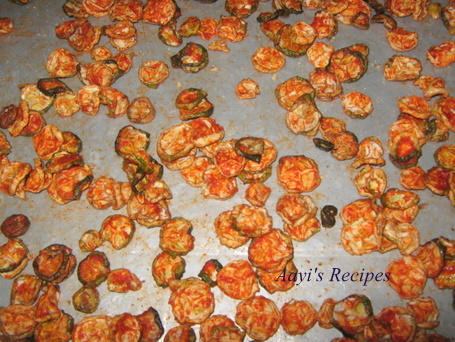 Shilpa, Can you please suggest what other vegetables can be sun dried in a similar fashion? Please check out sundried items link given in the post. Hello Shilpa, I had tried this at my friend’s place a long time back. I have always wondered how its made, now I know. I will definitely give it a try. BTW, I am giving blogging a shot, if you have any comments or suggestions, please drop in a line, it will be much appreciated. Thanks for the vodi recipe. My granny does this. We at times use bitter gourd (karate) and chitmitaki instead of tendli. Whata wonderful idea ,never tried this before sounds great. It looks very delicious! Thank you for your receipe! I think you know that some kachris are bitter also like some cucumber. An alternative is not to apply chilly and asoeftida powder before drying. Sprinkle later after frying. Try not to dry in the sun but under a fan indoors. Even if you keep the tray outdoors in the sun, see there is no direct sunlight on the mass. Put a canopy like shade. The quality will be very much improved. This sounds new to me…. 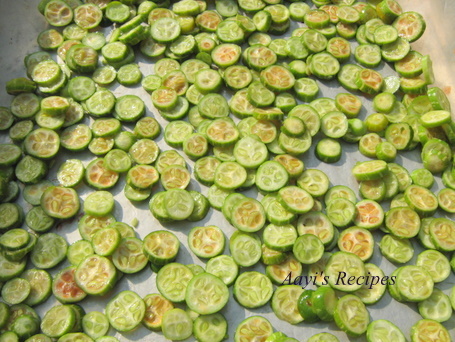 Looks so good…..
never knew we cd sun dry these cuties too…I do them for tomatoes, chillies and bitter gourds….and yes, it wd taste yum with curd rice. Since I love dried chilies and kovakka (tindora), I thought I would try this recipe. It was a hit at my house. Thank you for posting it. thanks for receipe. my grandma use to prepare this n i wanted to try this, but no one could guide me, thanks for the same.